Can I tell you that I'm really enjoying these Friday chats with you all? Its so great to talk about all things blogging and hearing what's on your mind. I love reading the comments to the BlogTalk posts, seeing old and new faces chime in. The only thing that could be better would be hanging out in person. Well then. Let's try that shall we? I admit it...I'm not a very techy person. When I hear about something new, I usually run to my younger brother and ask him to explain it to me. So that's what I did when I first heard about Google+ Hangouts. Not familiar with G+ Hangouts? Basically, its a virtual chat room you can sit in with up to 9 of your friends. According to my brother, the best hangouts function like a roundtable. You know the show The View? Like that, but on the internet. And you're Barbara Walters. 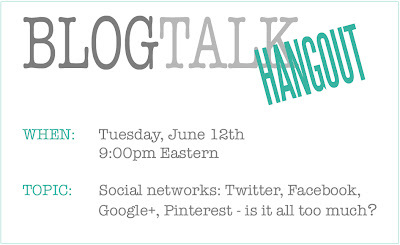 So, curious creature that I am, I thought I'd like to try a Hangout with 9 of my blogger friends. I think its a really interesting technology with lots of different applications... chefs are using it to teach classes; reporters are using it to stream news stories as they happen; and Presidents of the United States are up on it too. But design bloggers... where are they on Google+? Nowhere (at least not that I can find). 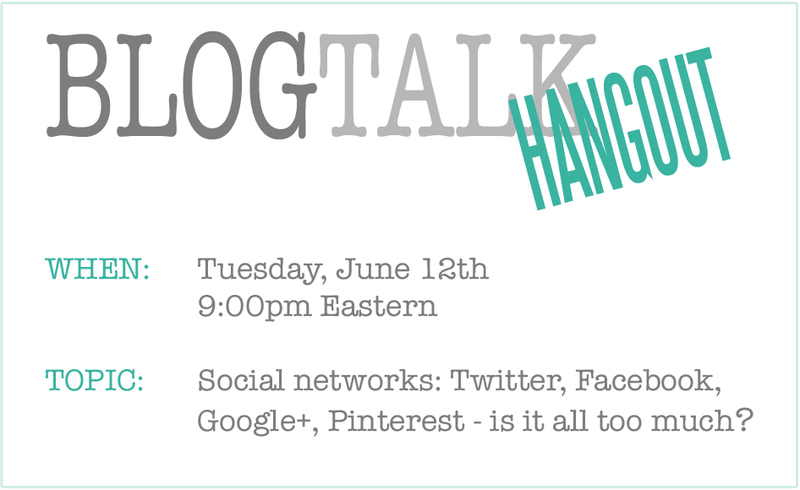 I feel like G+ Hangouts may be the next frontier where we bloggers and readers can connect. I know, I know, we're already connected on Twitter, Facebook, Pinterest etc etc... but there's nothing that can replace talking face-to-face (or screen to screen). You with me? Let's give it a go! So how is this all going to work? Leave a comment and let me know if you'd like to be a guinea pig and figure this all out along with me. Unfortunately, only 9* other people can join me in the Hangout so I'll have to randomly pick if more than 9 of you are interested. It would be so cool to meet some faraway blog friends for the first time! C'mon, let's give it a try!